Business Processes are governed by business rules that make sure their proper execution according to the strategies, objectives and philosophy of organizations; Business rules establish the procedures that must be executed and the conditions that must be evaluated and controlled in the Process flow. A Process automation initiative offers organizations the possibility of yielding the evaluation and execution of these rules to Bizagi, letting people focus in the real important things, reducing errors, time and providing agility to Processes. The fourth step allows you to create, edit and delete Business rules oriented to control the process flow, or execute validations, perform calculations, among others. 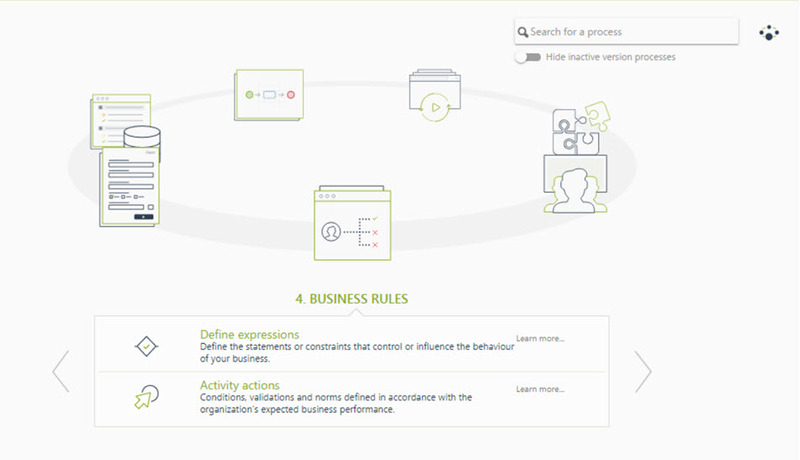 This step has two main options, which offer a graphical environment where you can define and manage your business rules easy and intuitively; with our powerful Business Rules Engine you can design from the simplest to the most complex business rules. •Define expressions: Controlling the sequence flow to define which path a Process must follow according to specific business conditions. (e.g If a travel request was approved, proceed with the flight booking, otherwise, notify the rejection). For more information, refer to Routing the Process. •Activity actions (events): Executing the necessary procedures when performing a task such as validations and calculations (e.g When an employee reports the expenses made in a business trip, the total value of expenses must be automatically calculated). For more information, refer to Performing actions in Activities. •Managing the user interface: Making form's controls visible, required or read only to avoid errors in the information entered into Processes. (e.g If a travel request is rejected, the rejection comments control must be visible and required, otherwise they must be hidden). •Allocating users: Defining the conditions that users must comply in order to be allocated to a task. (e.g If a claim is related to Invoicing it must be assisted by a customer service agent specialized in invoicing claims). Note that in Bizagi all rules must have a different name, so you will be prompted with a message when trying to create a rule using a name that is already being used.